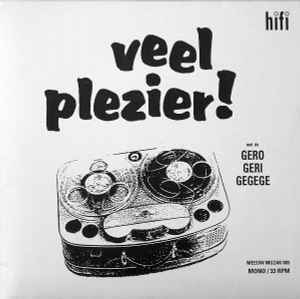 The Gerogerigegege ‎– Veel Plezier! This record is dedicated to Tsurukoh Shofukutei. His golden age and forever all Tsurukoh fans. DJ by Tsurukoh Shofukutei - 1980. Produced for Meeuw Muzak 1995. Recorded at Juntaro' house on 1980 by mono cassette recorder. Mastered at Otoguro' house on summer - 1995. Special thanks to Jos Moers. Limited to 400 hand numbered copies. Part of them marked as 'Japanese edition' spread and signed on post-it by Juntaro Yamanouchi. Comes with a booklet containing illustrations, liner notes and contact info in Dutch and English, including newspaper with Gerogerigegege's CD review. Tracks listed as "Middernachtverhaal, Deel I" and II on back of sleeve.